In the last few years, it has become perfectly normal to see or hear a random passer-by behind you or next to you apparently talking to him or herself in a loud voice without even being slightly aware of your presence. All sorts are involved: men in smart suits, women in summer dresses blown about by the wind, skaters with boards under their arms or nose picking teenagers boredly waiting for a bus at an overfull bus stop. Unashamed and in full abandon, the mobile equipment pulled from their chest or trouser pocket, walking bag or briefcase, from within their own bubble, they desperately seek contact with an invisible other. In the past (ten, fifteen years ago?) it was easy to recognize the average nutcase, absent-mindedly muttering to themselves in the vicinity of other people, with no concept of social conventions, fully immersed in the limited action radius of their own bodies, with the electropulse circuit in their heads run amuck - the eccentric primarily occupied with his or her own unfathomable concerns. Beyond any shame. Today, however, due to our publicly uninhibited mobile communication, the distinction between being crazy and well-adapted has become wafer thin and at first sight rather vague. The undercurrent emerges naked in snatches, and crudely and uninvited, pushes its way into the territory of random passers-by. Fascinated by communication processes in an age of technological acceleration, Robyn Backen plays with the margins and possibilities of both old and new codes and communication systems, for example by using computer-operated technology. Actually, she plays an ambiguous game, courting both the desire to infuse worn-out patterns of thought with new life by making them visible, visually tangible and frequently also audible and readable as well as that other desire to enter into the old pact of the mysterious intangibility of language communication. For Backen, the frequent use of morse signs with many interesting visual, light & sound, and graphical possibilities is a perfectly usable bridge between the different old and new systems. 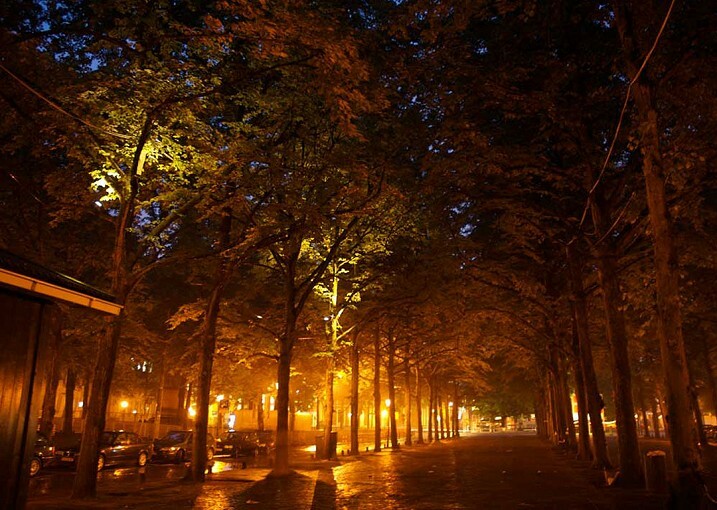 On the Lange Voorhout, using an ingeniously programmed sound and light system, again with morse codes, she gives visitors the illusion that trees are able to allow us to hear and see the left messages, questions and snatches of conversation of earlier passers-by. This they do at unexpected moments, briefly allowing you to become part of someone else’s conversation, the context of another story or the undercurrent of another life. Backen makes us doubt; what is real and what is unreal? The pre-programmed voice that responds to our footsteps, a light feint to the right that activates a sensor, or the voice in your ear that eases you away from where you are and transports you to a virtual world where according to agreed conversational codes, together with a ‘known’ other, you become involved in a fictional mobile adventure? Via an artificially set up seemingly at random language system, actually old-fashioned romantically and against her better judgment, Backen translates our fascinating, but ‘impersonal’ technology into a ‘human’ framework, and descends to the deeper layers of our brain system. Perhaps she will seduce you into thinking that in the future, both systems could converge in perfect balance; two systems, two worlds entangled in each other’s networks, technology and brainstem, which understand (hear & comprehend) each other in an infinite in&out current of words, so that eventually, communication will be without beginning and without end. That desire for cyborg fusion with the gain of the other and the loss of yourself has a vertigo attraction for anyone sensitive to the fluid undercurrents between the self and the other. Robyn Backen has us listen to what trees may tell us in whispered tones as a foretaste of more to come. The 10th Den Haag Sculpture exhibition ‘De Overkant/Down Under’ celebrates this impulse and 400 years of connection between Australian and the Netherlands with the theme ‘Curiosity, Discovery and the Desire for the Unknown’. The exhibition shows the work of 25 artists from both countries including Mikala Dwyer, Richard Goodwin, Fiona Hall, Tracey Moffatt, Ricky Swallow, and more, with ‘sculpture that is earthy, surprising, frivolously serious, frank, to-the-point and different too,’ exploring the horizons of the globe and the imagination and desires of artists traveling to (and from) the other side. At the opening ceremony the Australian Ambassador speaks of the capacity of art to inspire and challenge us “Art is what underpins the very fabric of civilisation, it alone has the capacity to ennoble us and make a civilisation great”. In reference to the contemporary political climate, he continues, “a society that ignores the ennoblement of the spirit, a society that does not cultivate the great human ideas, will end”. in violence and destruction. He notes that ‘contemporary art posits a new context - one not located within a particular country, but rather in a state of transit’, and talks of the universality of work that speaks from the heart, whose messages resonate across geographical and cultural distances around the globe. Queen Beatrix of the Netherlands inspected all the works and opened the exhibition by raising Jon Campbell’s bright pink and green flag reading simply ‘yeah!’, a joyful affirmation of art in society, and artists vibrantly out there on the streets. Three pieces stand out in relation to the exhibition’s theme. Firstly, Natasha Johns-Messenger, winner of the Hague Sculpture Rabobank Award with ‘Labyrinth’, a subterranean hall of mirrors installed in the basement of the Escher Museum. The work offers an immediate and visceral experience of the exploration and curiosity that underpins the show. The museum’s mosaic tiles work beautifully against the dark velvet obscurity, as a mysterious darkened hall beckons you in, confronts you with your own reflection, diverting your steps down another path, before throwing you back to the start. The next work to really capture my imagination and speak of the desire to connect, and find paths to each other is Robyn Backen’s Whispering Trees installation. Along the Lange Voorhout, this is a poetic rendering of fragments from mundane mobile phone conversation: ‘Hello, is that you?/Yes, it’s me!/Where are you?/I will wait here behind the tallest tree./See you in 15 minutes/Bye’. This everyday text is translated into Morse code lighting up the trees, and spoken by voices in 8 different languages. Passers by who unexpectedly encounter the work show curiosity and intrigue, one couple stopping to kiss passionately amidst the crossing of languages, English speaking to Dutch, German to Japanese, Iranian to Greek and Chinese to Urdu. The sound of an airplane flies through trees in the direction of the American Embassy. It could be a real airplane but is it part of the work? Where is it heading, and are the trees really talking to one another? This playful interference with the perception of the passer by raises questions of receiving and transmitting. In a world of constant signals and instant messages, how do we hear clearly through the noise to identify who is talking to us and what they are saying? Where there is communication there is always noise. Robyn has carved into her kitchen cupboards the final Morse code message transmitted by the French Navy in 1997: “Calling all. This is our last cry before our eternal silence.” This speaks movingly to me of a disappearing language and lost opportunities to discover ‘new worlds’ at the end of a long journey into the future. Through a vanishing medium and technology, a poetic signal across the seas echoes in domestic counterpoint to this public display of personal communication. It’s the coming back that can be problematic for a long-term cultural nomad. Where is ‘Home’, when you have learned to make a home in any corner of that world that can offer you a space to work, dream and encounter new paths and directions? We each follow the impulse to find our own home in the world through a series of journeys, short and long, geographical and metaphysical, internal/external, and mythological. It is an art of writing the map as we go along, unfolding the path as we step out onto it, making the most of each meaningful coincidence, random encounter and deeper connection that we find along the way.